When I found out that Stephen Malkmus and the Jicks were presenting the world with a new album my mind was flooded with memories of when I would listen to Pig Lib forever and ever on end. Matter of fact, I loved the song 1% Of One so much that I would sing it out loud too often and annoy my girlfriend until she completely lost it and would demand that I stop singing that song in front of her. 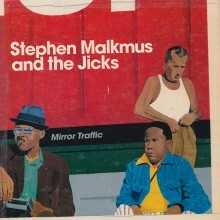 At times I would forget and sing that song out loud, and then realize my lady was near by and then sing it louder to help her understand that 1% Of One is a fantastic song and that Stephen Malkmus and the Jicks are fantastic! The new Stephen Malkmus and the Jicks album Mirror Traffic was released August 23rd, and my ears were just enchanted by their 15 tracks. I really didn't know what to expect because I had read many things prior saying Mirror Traffic is their best album yet, political statements here and there, great lyrics throughout, Beck helped produce, less signature guitar jam sessions, and so on, and so on... Although, this all may be true this album brings songs with grace, some songs with edge, and some songs that are truly Stephen Malkmus and the Jicks. Tigers is the first track and as soon as it started to come forth from the speakers it set me in the mood right away with the catchy guitar and melody. Later, it dives into a graceful No One Is (As I Are Be), and then into the rock'n and fantastic song Senator. Later, the mood swings back into something soothing and I realize that from the outside this seems like the tracks are listed in a kind of emotional rollercoaster, but I accept it warmly because as soon as a gentle song is done an upbeat song comes up and I'm ready to dance. Mirror Traffic is much different than the previous albums, but it has elements of what I loved in Pig Lib and Real Emotional Trash. Some of the great stand outs in this album are Forever 28, and No One Is (As I Are Be). I also loved the atmospheric track Jumblegloss, because it gave me images of weightlessness and floating. As a whole this is a great album.